Hello everyone! I hope you are all doing well. 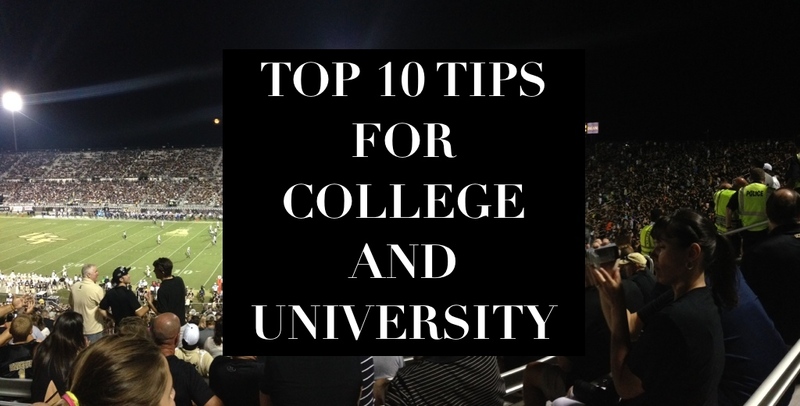 My mini “back-to-school” series is coming to a close, so I decided to end things with this helpful post filled with tips and tricks for college! Let’s have a chat, shall we? 1.) Get Involved – This is a great way to meet people and to explore your interests. It may seem awkward at first, but most colleges have groups and clubs for just about anything. It’s all a matter of finding that is right for you. There’s no harm in going to a meeting just to see if you like it or if the club is for you. 2.) Don’t Buy Books From The Campus Bookstore – Save yourself some money and buy books from places like Amazon, Textbook Solutions, Chegg, etc. These places often sell used books, new books and books for rent that are way cheaper than the prices offered at your school bookstore. 3.) Go At Your Own Pace, But FOCUS – College can be very difficult, so it is important to protect your sanity and go at your own pace. However, do not forget to focus because you’re (most likely) in school for a reason and that reason is education. 4.) Try To Make Friends In Your Classes – Support systems are great, especially in class. I know it sounds very awkward and scary, but try to make friends in your classes. This will allow you all to support each other (via study sessions, tutoring, etc.) when class gets tough. Don’t know how to break the ice? Ask them how they thought the quiz or test went. Or ask them how they did on the homework. Start small! 5.) Enjoy Yourself – College is the time to explore who you are as a person and to find out what you like and don’t like. So get out there, and enjoy yourself. Getting out of your comfort zone can be awkward, trust me, I’ve been there. But you’ll never know how much you like or dislike something until you try! 6.) Get A Laptop – This is self-explanatory tbh. 7.) Come Prepared – Do you know what happens when one person in the classroom forgets their scantron? Everyone else feels uncomfortable because it’s so mortifying for that person. Don’t be that person. Bring your school supplies. 8.) Don’t Be The Messy Roommate – This is just gross tbh. I know some people just aren’t clean and that’s fine, but if you’re living with other people please try to make an effort. I guarantee that if you’re the messy roommate your name is being slandered up, down, and sideways. Try and be clean OK, please? 9.) Be Patient – It’s going to take time to establish yourself in your major, it’s going to take time to make long-lasting friends, it’s going to take time to use the communal shower, it’s going to take time to get lunch when the line is long. Remain patient. 10.) Remember that you’ll be fine – There will be times where college tries your life and it will make you want to scream. When this happens, just remember that it’ll all be over eventually and you will be fine. Previous Top 5 Favorite High-End Eyeshadow Palettes For Beginners! These are great tips! 🙂 A lot of them would work for just about anything, especially the making friends part. That is useful anywhere. Amazing tips ! I’m Going back to college this winter! I’love keep your advice in mind! These are such good tips. I wish I had found posts like this before I went to uni. Now after graduating I really feel like I missed out on a lot of things because I was trying to be an adult too much and too soon. Also I was very shy. I focused so much on part-time work and studying that I forgot to make friends. I regret it so much now. I lived in a house share for a year and a half and as much fun as it was, it was also a nightmare. I have never met more messy people in my life. Here I was thinking I was messy, but boy was I wrong. I can’t even put it to words, it was just disgusting. I told myself never again. If I want to move out, I’m doing it without messy students. I feel you on the adulting too soon, I took a lot of internships whilst I was in school that would stop me from hanging out with my friends a lot of the time. And I was shy for a while as well, especially during the first year. I made great friends in college, but I often feel like I didn’t hang out with them enough because I was too shy to, if that makes sense? I’m glad I never had to houseshare, but I’ve seen and heard the horror stories. I don’t know how people can be so blatantly messy whilst living with strangers!